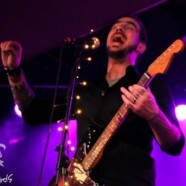 Before Saint Asonia became an entity, former Three Days Grace frontman Adam Gontier was spending time playing solo acoustic shows here and there. Then guitarist Mike Mushok made a call and the rest was history. The band released their debut record in 2015 to extreme critical acclaim and found the band on numerous headline tours, mega-bill tours and every major festival in the United States. 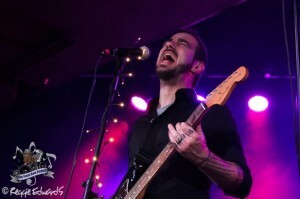 They’re currently in the studio writing and recording their highly-anticipated sophomore record so, while the band writes the instrumentals, Gontier decided to hit the road for a small string of solo acoustic dates and the tour recently hit Fort Wayne’s Hub Entertainment Center for an Acoustic Election Night Party. After South Bend, Ind.’s In Crimson wrapped up an hour-long acoustic set, and after a lengthy wait, Adam Gontier took the stage for what ended up being a very cool, rare type of set that you don’t get to see often. He quietly walked to the stage with an E-cigarette and a cup of hot tea, no intro music, picked up his guitar and the crowd went insane as he began playing “Fairy Tale” from Saint Asonia’s debut record and immediately afterward ripped into “I Hate Everything About You,” giving the crowd chances to sing the chorus early on. The night was a special experience- a very stripped-down, simple set that saw him on stage with just a mini amp along with an acoustic guitar and an electric, playing a few covers, some Saint Asoinia tracks as well as some Three Days Grace songs he hadn’t played in years and that some people had never seen him play live. He interacted with the small crowd on numerous occasions, taking requests and answering some questions along the way- it was almost like a VH1 Storytellers session- which Gontier even pointed out at one point when someone from the crowd started yelling out questions for him. He was in a great mood, too, joking with the crowd at times- one of them being when he took a few hits of his vape between songs and told the crowd to hold on because it was his only pyro for the night. With covers that included “Every Rose Has It’s Thorn,” “Free Fallin’” and “Stand By Me,” Gontier sprinkled in a little twist here and there- an almost bluesy feel to the songs, which showcased his voice even more perfectly. Playing around 15 songs, the set clocked in just around an hour-long and gave everyone exactly what they could have wanted. For some, it was the first time they were able to see Gontier perform songs like “Chalk Outline” or “Never Too Late,” which were met with overwhelming response. After he finished up, he took some time to wind down before heading to the merch booth to meet with fans, sign autographs and get to know those in attendance. On a night where many people in the country were divided and watching nervously for the results of the Presidential Election, Gontier provided an escape and a break from the nerves and emotions of the night and left everyone with positive vibes and smiles on their faces.